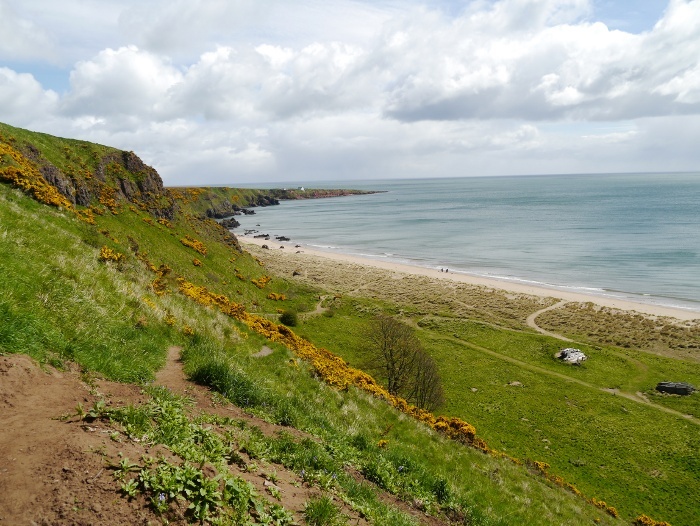 My hope was that with the last two TGO Challenges being a wash out, this year would see a return of settled May weather. This was not to be and Challengers were all battered by rain, gales, snow, hail and finally burnt by the sun. I have to say that I was very happy to eventually dip my toes in the North Sea on Thursday. I had been plagued by a problem with my foot and ankle since the fifth day when it swelled up and went a very unattractive shade of yellow. I had to bail and seek medical advice which resulted in a day off and becoming a day behind my schedule. Thankfully I returned to that spot and limped to the finish, eventually catching myself up. Ankle aside I thoroughly enjoyed myself this year. I engaged much more in the social side of the Challenge and spent a few days walking with other Challengers. I also found myself frequenting more drinking establishments. Discovering that there is more to the Challenge than just a long walk. Anyway, it will take a while to sort through my photos (I took surprisingly few due to the weather) and do a write-up. In the meantime a quick taster. 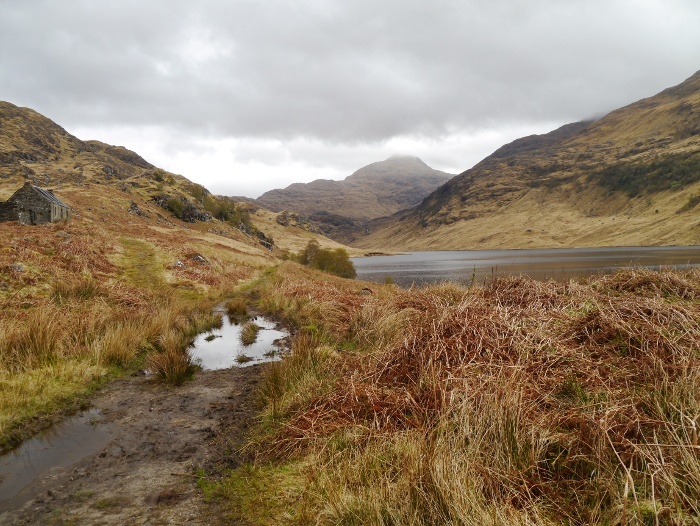 Just before the climb up Mam Barrisdale I could feel the wild country of Knoydart envelop me. Unfortunately mist and rain enveloped the hills instead leading to a very wet first day. The weather on the first Monday was rather tempestuous. Strong winds and heavy snow saw me abandon my plans for a trackless wander across the Monadhliath mountains. 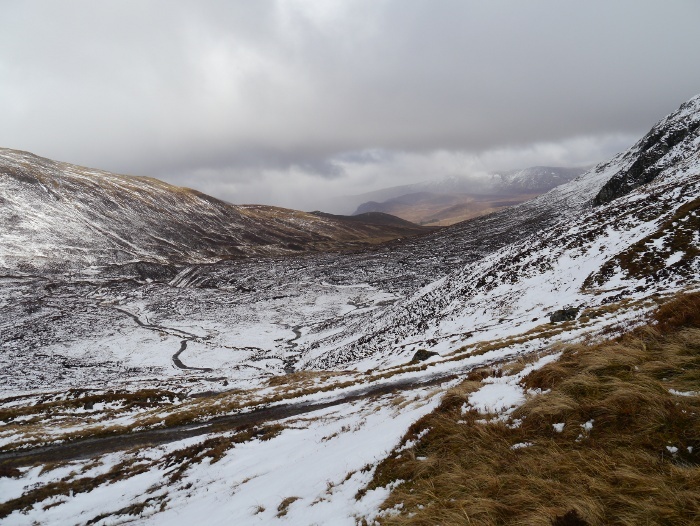 Instead I took to the Corrieyairack pass where the wind combined with the snow at the summit made walking difficult. 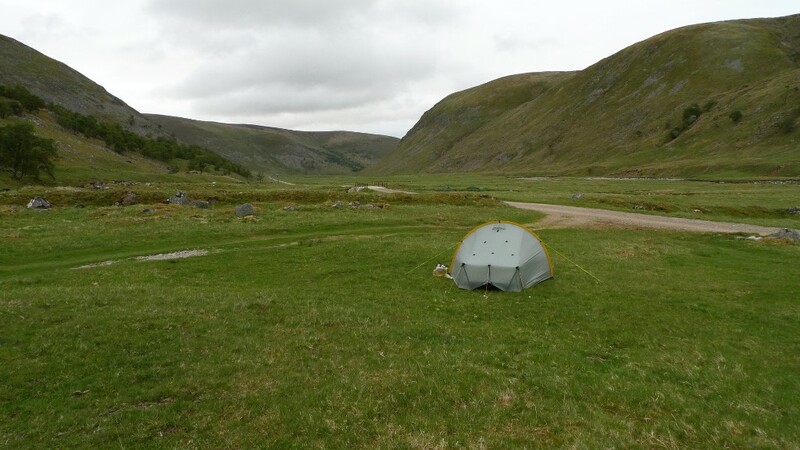 My favourite camp of the whole trip was in upper Glen Feshie. It’s a wild and magical place and a picture perfect image of the Highlands. It was also mostly dry which is nice! Reaching the east coast at St Cyrus, the sea was a very welcome sight indeed. The beach there is a lovely spot to end a coast to coast walk. In a couple of hours I set off on the long journey to Mallaig via London. Feels a bit strange heading south for a couple of hours before heading north again. With our fragmented public transport system that is the cheapest way of doing it. Anyway, all going well this blog will be silent over the next couple of weeks. Lets hope the sun shines at least some of the time. I’ll be tweeting some pics and stuff on the way between west and east coasts. You can follow my random words via @bpackingbongos. I probably should be taking training for the TGO Challenge more seriously. 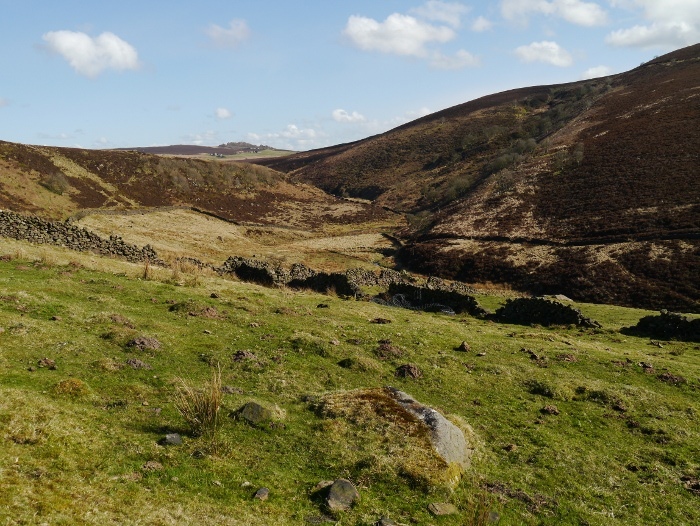 I originally had planned to go for another backpack, but after the previous weekend exertions in Allendale I really could not be bothered. 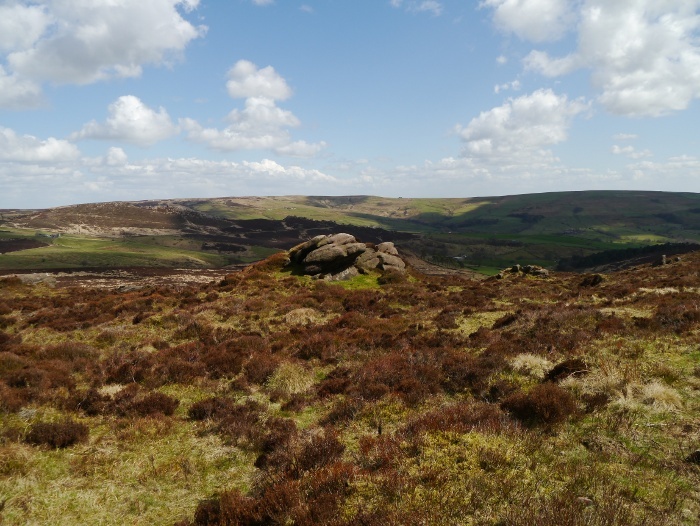 Instead I decided on a really long day walk in the Peaks, getting used to miles under my feet, that sort of thing. However I ended up getting up too late and got a bit lost on the drive as I decided I could do better than my satnav. Therefore it was not far off noon when Reuben led me out of the almost deserted car park in Gradbach. The mileage would have to be far shorter than planned. 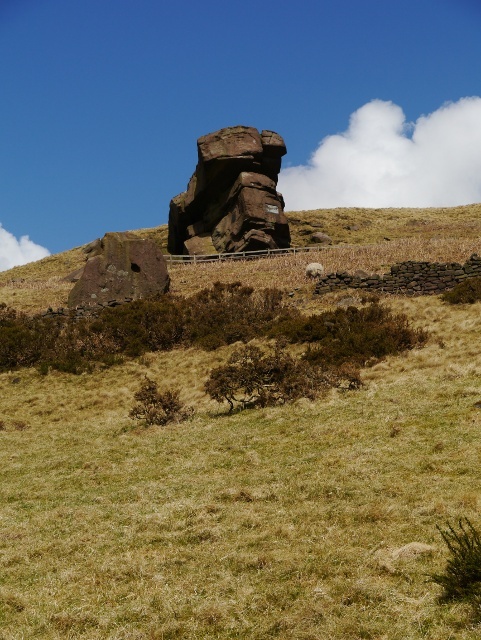 My usual route when walking the Roaches is to ascend via Lud’s Church, a fine rocky chasm hidden in the woods. Fancying a bit of new ground we followed the Dane Valley Way. 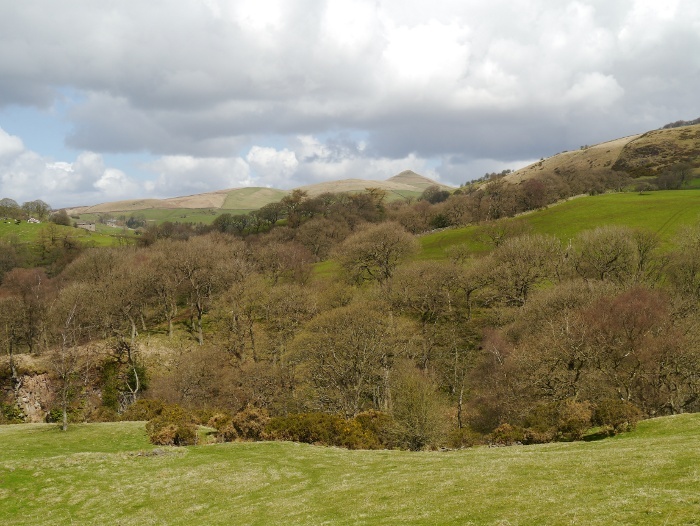 We walked the section as far as Danebridge, a very pleasant stroll in the spring sunshine. 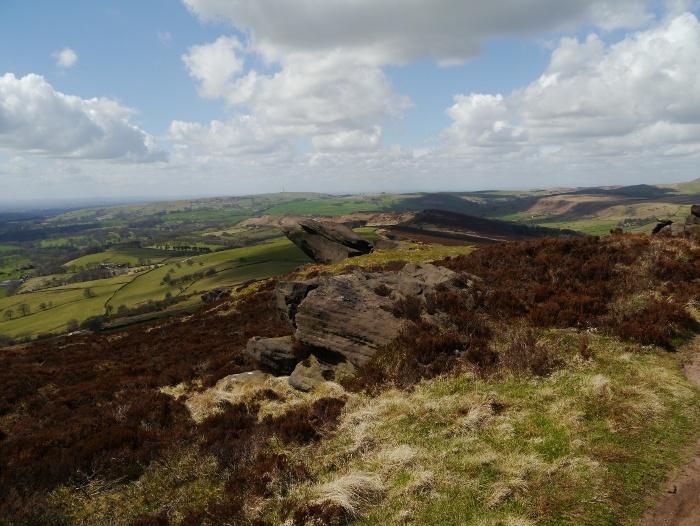 There were views across to Shuttingsloe, which is often comically referred to as the ‘Cheshire Matterhorn’. It does have a slightly pointy top though. Just before reaching the road a concessionary path led us steeply up through some woods and past Hangingstone farm. I did not know that the nearby Hanging stone had a concessionary path to it so I admired it from a distance. Although to be honest I could not really be bothered to climb up any further. 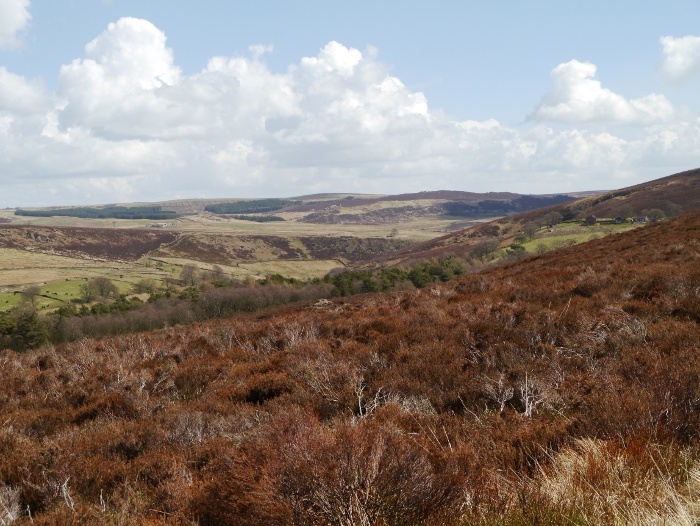 I had never walked the wedge of moorland named Back Forest on the map. Judging from the path along the wide ridge it does not get as much foot traffic as the nearby Roaches. 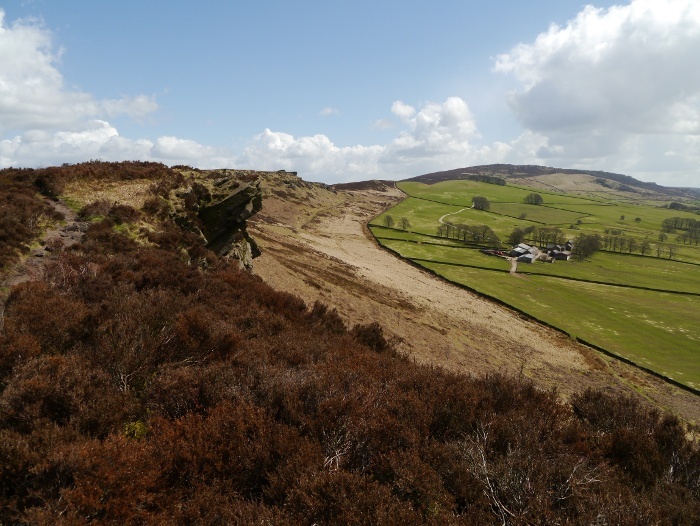 It gave a pleasant airy walk, the odd outcrop providing some visual interest and somewhere to plonk Reuben so I could take a photo. 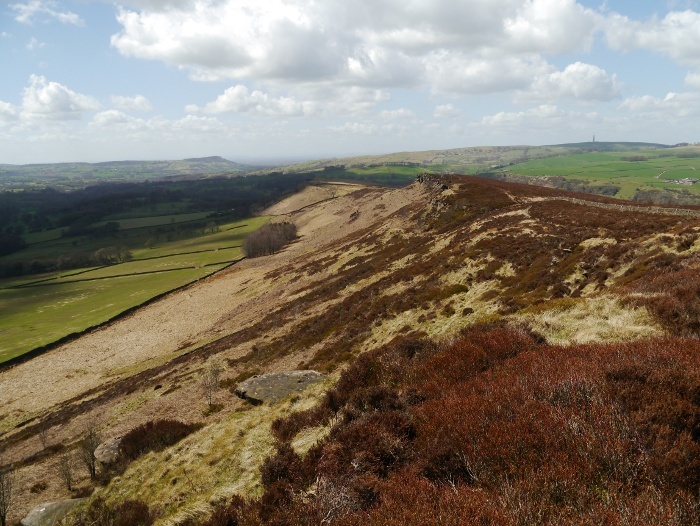 The Roaches itself was strangely devoid of people, a nice surprise considering that it can be such a honeypot. However the lack of people was balanced by the sheer amount of tissues that littered the path. How can people be so careless when blowing their nose? The weather forecast had promised heavy thundery showers and I watched a few drift by in the distance. However, because I was keen to test out a new waterproof jacket we managed to spend the day under a small patch of blue that moved with us. 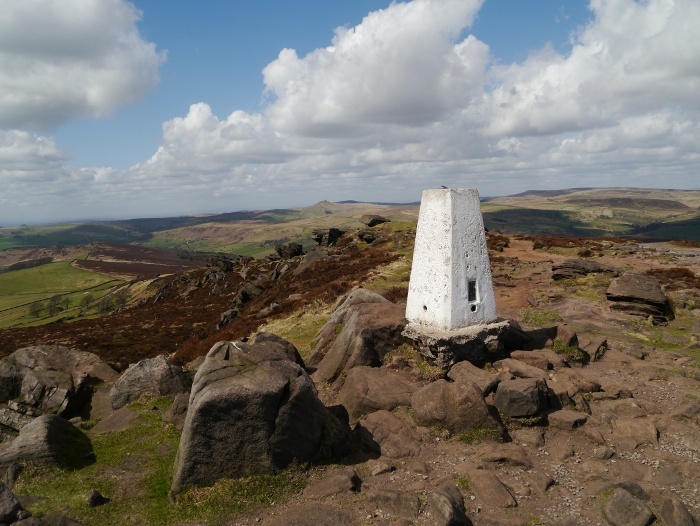 The Roaches provide a high level promenade without much effort required once height has been gained. Reuben has a special knack of enthusiastically greeting people who are not too keen on him. He went bowling over to one couple sitting having a break to introduce himself to their small spaniel. I was told that their dog was nervous so both myself and Reuben sloped off with our tails between our legs. Past Doxey pool and there was a voluntary diversion in place to avoid nesting Peregrine Falcons. 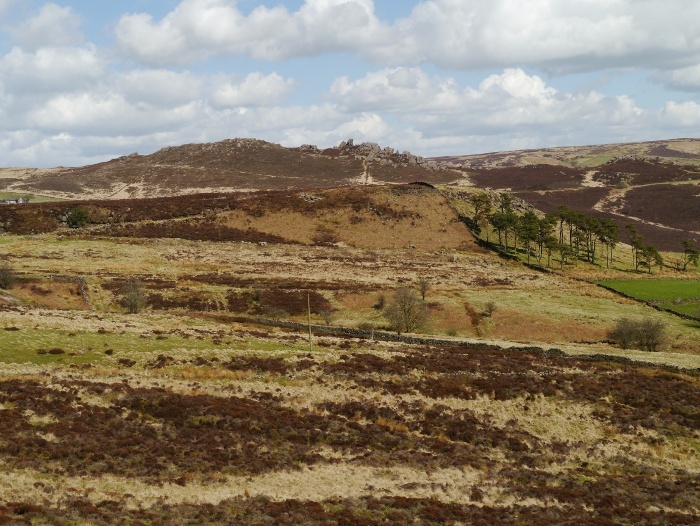 We took the right of way to the left which sadly misses out some of the best views towards Hen cloud. 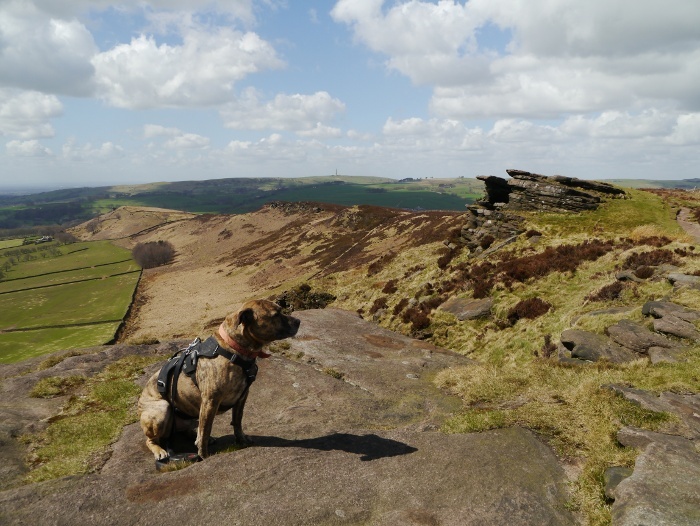 We were soon out of the wind where I found a perfect spot to sit and have a late lunch whilst Reuben looked on forlornly. I started thinking that if I got home early enough I could share a curry takeaway with my wife. 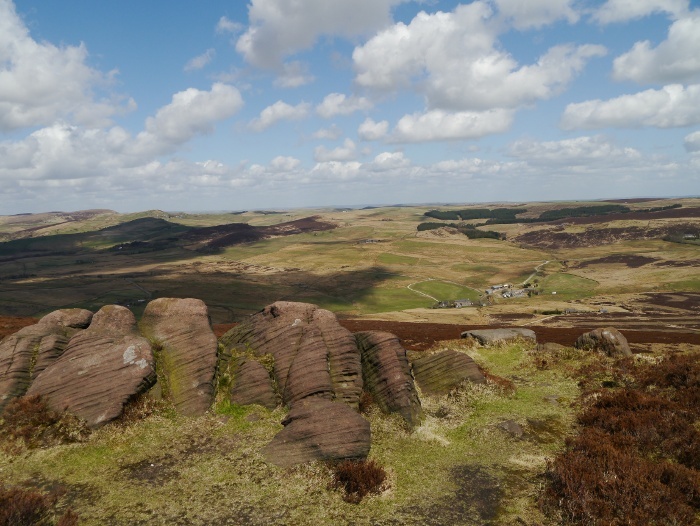 Suddenly the idea of climbing Hen Cloud and looping up and over Ramshaw rocks became much less appealing. I was now motivated by my stomach rather than any notion of increasing my fitness. 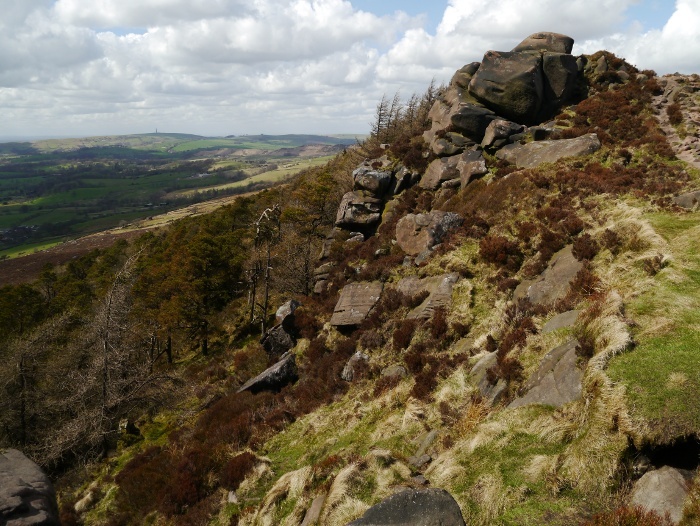 Ramshaw Rocks looked impressive on the horizon as we lost height. A farm track led us onto a lane which we followed for a mile or so. During lunch I had decided that my new waterproof would not be tested by any of the showers that appeared to purposely be missing us. However with it tucked safely in my rucksack a beefy hailstorm came along and gave us both a battering for a few minutes. There was a bovine blockage whilst walking through the fields above Black Brook. Every eye was on Reuben as we passed through cows with calves and then a group of bouncy young males. I kept as close to the wall as possible in case I needed to make a hasty retreat. The cows thankfully were no bother but a couple of the boys were much braver. It took a bit of jumping up and down and waving of arms to stop their advance. Dogs and cows really do not mix very well. Cows aside it is a nice scenic section. Back at the car I realised that we were ten kilometres short of what I had planned. I will have to train properly for the TGO Challenge whilst actually walking it. On the positive side I got home early enough to order a lovely curry. It is traditional for male outdoor bloggers of a certain age to share gear spreadsheets every now and then. However I would find doing so a form of purgatory. Spreadsheets are for using at work, even then I do them so badly that someone else will volunteer to take over. I will save the gear spreadsheet for when I’m finally placed on some form of medical spectrum. 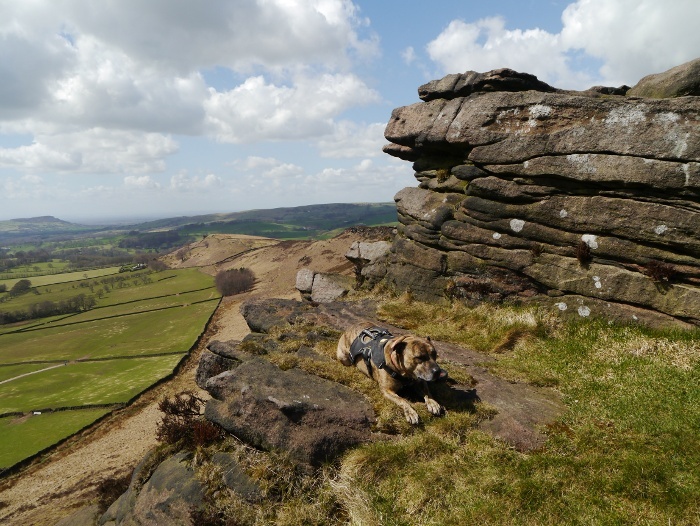 Instead, just incase readers are interested I thought that I would do a quick run through of what I’ll be taking on this years Great Outdoors Challenge. For me it’s about getting a balance between weight and comfort. There is no point in trying to save weight if its going to make me miserable. I’m not the sort of person who finds joy in backpacking for two weeks with one pair of underpants and socks for example. Anyway, here goes. Feel free to pick holes in my logic, I’ll simply ignore you anyway and take what I want to take. Arcteryx Atom LT Hoody – This is probably my favourite item of clothing. A synthetic filled jacket which I find just as good for sitting around camp as walking the hills in cooler weather. Not as warm as a down jacket but more versatile, especially if conditions turn out damp. Haglofs Essens Down Vest – This packs down to nothing and weighs in at 180 grammes. Purchased on an impulse yesterday, this will boost the Atom Hoody when in camp or provide extra warmth for sleeping. Smartwool baselayer – I really rate Merino for long backpacks. This one is warm, does not itch and I can wear it for days without it stinking. The only downside is that it is yellow and does not suit my comedy belly. Rab Aeon Tee – I am taking both the long and short-sleeved versions. Together they weigh pretty much nothing and are soft and silky smooth. I’m wearing the long-sleeved one as I type this as it is so comfortable. Rab Cirrus windshirt – Great for keeping those breezes at bay when it is too warm for a jacket. Mine is the special venting edition as it is falling apart and full of holes. Montane Terra Pack Pants – These are the lightweight versions of the popular Terra Pants, which I find too warm outside of winter. I’ll be wearing a pair and will have a spare in my pack. I’m sure that many will think this is overkill but I like to have a complete set of spare clothing on a long backpack. When staying in b&b / hotels I can wash out the ones I have been wearing and then hit the pub in a clean pair whilst they dry. This will save me having a well-earned meal and pint in my underpants. Finisterre Zephyr Boxers – These Merino boxers are soft and comfy, they also can be worn for a while without getting too stinky. I’ll be taking two pairs. Inov-8 Flyroc 310 – I did the 2011 Challenge in these shoes and they worked really well. That pair have long since been retired so I have recently purchased the updated version. A backpack and two long days walks and they are nicely broken in. X-socks Trekking Expedition Short – I have found these to be the best socks to wear with trailshoes. They are lightweight but have a bit of merino for warmth. They are shaped for each individual foot and dry really quickly when wet. I’ll be taking three pairs. M&S leggins – Lightweight cotton numbers for sleeping in. Keeps the bag clean. Extremities Polartec hat – For keeping my noggin warm, works well under the hood of the Atom Hoody. Berghaus fleece liner gloves – I have unusually warm hands when trekking and these are the only gloves I used during this past winter. Light and dry quickly. Rab Neoshell Myriad jacket – A new purchase from my lovely wife for my birthday. It has yet to see any rain but I have high hopes for this jacket which is new on the market. I have heard good things about the Neoshell fabric, should keep me dry and comfy in typical Challenge conditions. Rab Drillium eVENT trousers – They served me well on the last Challenge so will be coming again. Light and very breathable. Integral Designs Shortie eVENT Gaiters – Come to just above my ankles, more to keep crud out of my shoes than to keep my trousers clean. 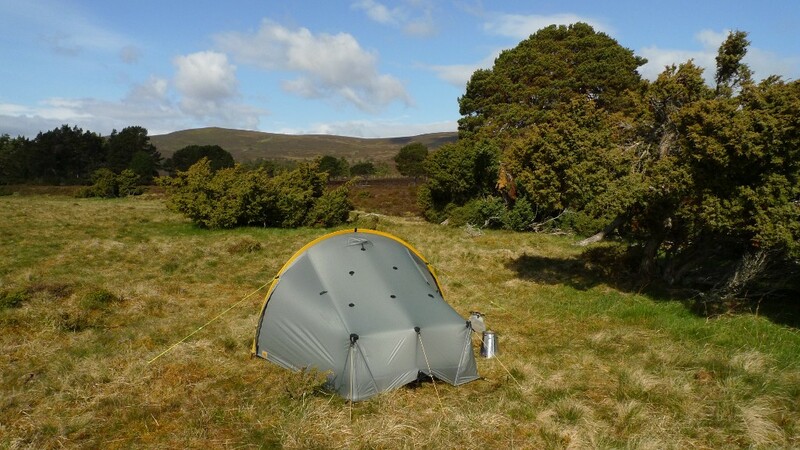 Tarptent Scarp1 – My favourite tent, ever. It’s roomy, has two porches and is stable in bad weather. A joy to crawl into at the end of a long day. Heavier than the MLD Trailstar but I feel it is nicer to live in for two weeks. 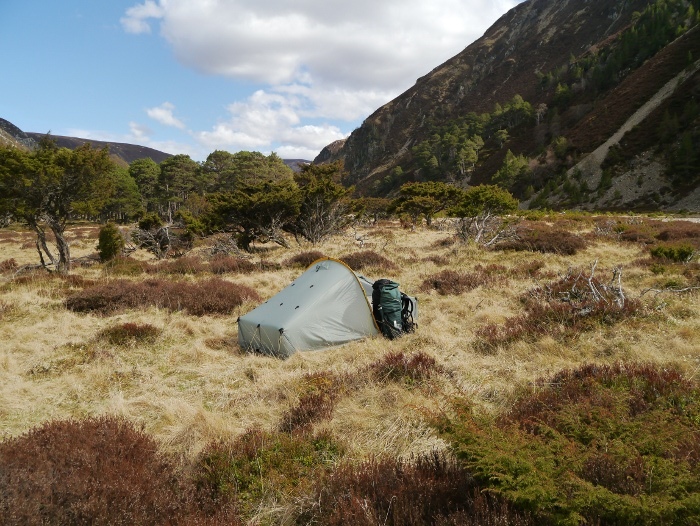 Exped Synmat UL 7 – I was going to take my trusty Neoair but I have now decided it is no longer so trusty as it slowly deflates during the night. I received the Synmat a couple of weeks ago and it is untested out in the field. On the spare room floor however, it is very comfy indeed. 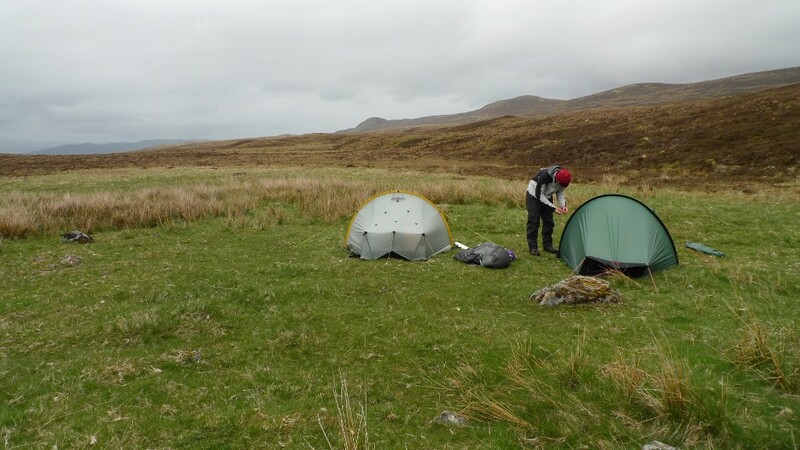 PHD Hispar 500 – Even in May the night time temperatures can plummet well below freezing in the Highlands. A few extra grammes is worth carrying for a good nights sleep. ULA Catalyst – This has been on all of my backpacks for nearly four years now and has served me faultlessly. It is a good combination of weight versus supportiveness. It has a large enough capacity to carry food and gear for a two week trek, yet its volume is easily reduced for those final days. It’s looking a bit rough round the edges now so fingers crossed it will get across in one piece. Jetboil Sol Aluminium – I love this little stove and find that I stop and make a hot lunch when backpacking because of it. Also when in camp I find myself drinking more hot drinks. There is not the same level of faff that I used to have when using a meths stove. I will take one 230g canister of Primus power gas. This should last me until near the half way point where I’ll buy another in Kingussie. Sawyer Squeeze filter – The easiest water filter that I have used. Most of time I will probably not bother when deep in the hills. Good for when nearer civilisation. Pacerpoles Carbon – With my creaking knees I feel that poles are essential for when backpacking. Pacerpoles are the best that I have ever used. They improve my posture and give my upper body a bit of a workout as well. Highly recommended. Kindle – One of the joys of backpacking is to spend the evening engrossed in a good book. I am currently reading IQ84 by Haruki Murakami, a hefty tome that would be impractical to take in book form. Satmap GPS – This will be switched off most of the time and will only be used to confirm my location in poor visibility. My crossing of the Monadhliath is particularly navigationally challenging as it goes across the grain of the land. Good to have ‘just incase’. First aid – containing all the essentials as well as anti-chaffing cream and a whole host of medication to keep my rebellious body going. Tikka XP 2 – It’s a torch and will help me see in the dark. That’s what torches are for. There are a few more odds and sods in the pile in the spare room but I’ll stop now before I bore you to death. I have no idea what the total weight is yet. I will be starting off with enough food for three days. I’ll weigh the sack when finally packed. After all of this gear talk I think that I should provide a bit of balance by showing a few wild camping photos from my last Challenge. In the end it is all about getting out in the hills for a couple of weeks. 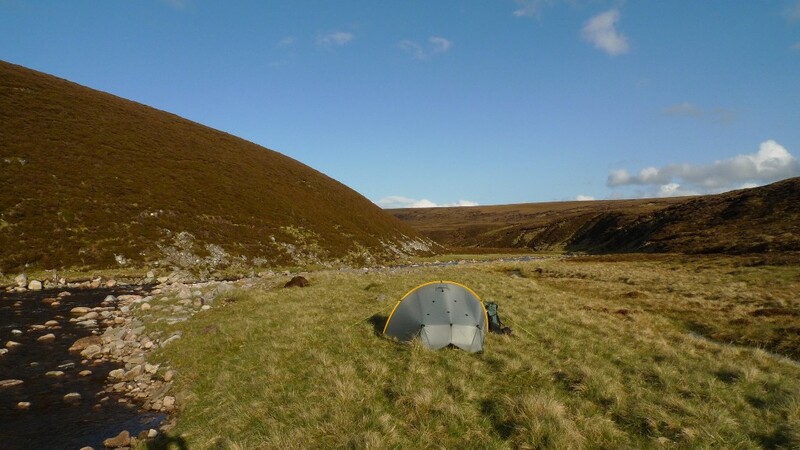 For me wild camping is the best bit.